Belarusian authorities create problems for opposition activists who are crossing Belarusian borders. Isolation of the country is increasing. Following the departure of EU ambassadors, the IMF decided not to have any resident representative in Belarus and the country's representatives were missing at an Eastern Partnership meeting in Prague. Anatoly Lebedko not allowed to leave Belarus. 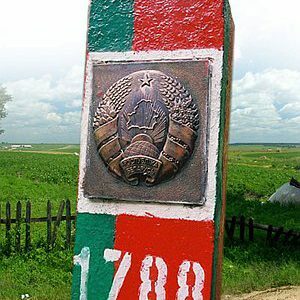 On 7 March, United Civil Party leader Anatoly Lebedko was not allowed to leave the territory of the European Union on the Belarusian-Lithuanian border. According to the politician, he was detained at the border checkpoint Kamenny Loh under restriction to leave Belarus. Two other opposition leaders – Siarhei Kaliakin and Viktar Karnienka were not allowed to cross the border. They subsequently managed to get to Lithuania, presumably through Russia. Belarusian customs detained Alexander Dobrovolsky. On 7 March, the United Civil Party member Alexander Dobrovolsky was detained at the border with Lithuania. Dobrovolsky went to Minsk from a working meeting in Vilnius. Belarusian customs invited him to a separate customs control, resulting in Dobrovolsky having to wait overnight for the next train to Minsk. Syarhey Kavalenka set to continue his hunger strike until he is released. Syarhey Kavalenka is determined to continue his hunger strike until he is released. The opposition activist is currently in a prison hospital in Minsk, since the beginning of his hunger strike he lost 30 kilo. On 24 February, a district judge in Vitsyebsk sentenced Kavalenka to two years and one month in a low security correctional institution on a charge of violating probation rules. Young opposition activist Ivan Shyla to spend 22 days in jail. Young opposition activist Ivan Shyla has been placed in the detention centre on Akrestsina Street for 22 days to serve earlier imposed jail terms. The deputy chairperson of a Czech-registered youth group called Malady Front was arrested in Minsk on February 14 near the office of the Belarusian PEN Centre, where Malady Front activists were scheduled to present the "I Love Belarus" award. BAJ urges to abolish warnings to its members. On 2 March, the Belarusian Association of Journalists submitted an official letter to the Hrodna regional prosecutor, Viktar Marozau, in which the difference between freelance journalists and foreign media journalists is explained. The reason for the letter was a series of warnings to BAJ members Mikalai Dziachenia, Aliaksandr Dzianisau, Viktar Parfionenka and Hrazhyna Shalkevich for work with foreign media without official accreditation. Ministry of Justice refused to register BCD. Ministry of Justice took a final decision to deny registration to the Belarusian Christian Democracy party (BCD). Considering the BCD documents, the Ministry of Justice has found a number of inconsistencies and contradictions. BCD also announced that on February 17 all party websites were blocked. Appeal to LT Foreign Minister. VISA-FREE Coalition "Go Europe! Go Belarus!" appealed to the Minister of Foreign Affairs of Lithuania Audronius Ažubalis to support further steps to promote people-to-people contacts and facilitation of ties between Lithuania and Belarus. The Coalition proposes to amend the legislation of Lithuania to allow the consular offices of the country to regularly issue short-term multi-entry Schengen visas with a validity of five years, rather than one year, as is still provided. The appeal was signed by NGOs, initiatives and campaigns from Lithuania, Belarus and other countries. U.S. supports expansion of the European Union sanctions against Belarus. This was stated by the U.S. representative to the OSCE, Ian Kelly, during a video conference on 2 March. He says that sanctions, being far not the main instrument of influence on official Minsk, should demonstrate the Belarusian authorities that they have chosen the wrong path of self-isolation. Lukashenka warns EU of harsh response to sanctions. On 4 March, speaking on the sidelines of an annual ski race involving top government officials, Lukashenka described as “absolute hysteria” the European Union’s latest move to extend the list of Belarusian citizens subject to entry bans and asset freezes. Lukashenka went so far as to apparently mock the sexuality of openly gay German Foreign Minister Guido Westerwelle. “It’s better to be a dictator than gay,” he said. National Platform Statement. On 2 March, Belarusian National Platform of the Eastern Partnership Civil Society Forum adopted a Statement in which expressed their deep concern at the diplomatic conflict between the authorities of Belarus and the European Union. NP urged the leaders of Belarus and the European Union to hold from further conflict escalation and transforming it into an exchange of blows according to the principle "an eye for an eye". Belarus absent at Eastern Partnership meeting in Prague. No representatives of Belarus arrived in Prague to attend a 5 March meeting of the foreign ministers of the Visegrad Group and Eastern Partnership countries. Vit Kolar, spokesman for the Czech foreign ministry, said that Belarus had been invited to send a deputy foreign minister to the meeting. IMF Won't Replace Resident Representative in Belarus. The International Monetary Fund will not replace its representative in Belarus after April, suggesting that having a resident in place was having little impact in the crisis-hit former Soviet republic. KGB chairman to travel to Rome despite EU entry ban. Vadzim Zaytsev, chairman of the Committee for State Security (KGB) who is subject to the European Union’s entry ban, is expected to travel to Rome for an official meeting. Today Lukashenka is taking part in the Interstate Council of the Eurasian Economic Community in Moscow to "give new momentum to the integration processes." With no EU ambassadors in Minsk, relations between Belarus and Western nations are at their lowest point in the country's independent history. The Belarusian government is increasingly relying on Moscow in its new conflict with the EU. 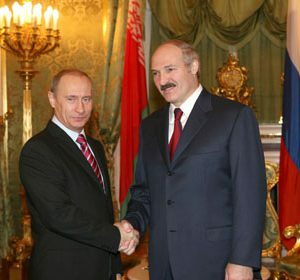 In February, Lukashenka and Medvedev issued a joint statement that Western economic pressure on Belarus is unacceptable. Last Sunday, the Russian Foreign Ministry declared that sanctions against Belarus threatened the economic security not only of Belarus but also the entire Customs Union, including Russia. It is no wonder then that for the first time in years a top functionary of the Belarusian regime talked about the introduction of the Russian rouble in Belarus. Has Lukashenka lost the equilibrium between the West and Russia? Polish expert Wojciech Borodzicz-Smoliński believes that recalling ambassadors and cutting staff in embassies in the long run may cause a fatal reshaping of the EU policy towards Belarus. He argues that the EU nations may lower the level of their representation in Minsk, because they can develop economic relations through trade missions. Dealing with the remaining few political aspects could be delegated to EU embassies in Moscow. After all, Moscow will increasingly control decision-making as a result of integration between the two nations. According to the Polish analyst, European nations can adopt an uncompromising policy towards Lukashenka, especially because they understand that they have no leverage to change the situation in Belarus. The EU will have even less opportunities to influence the country as Belarus will get closer to Russia, effectively losing its sovereignty. Belarus can preserve only the formal attributes of independence – like its own president, parliament, army, passports etc. But to understand whether Belarus is losing its independence it is useful to compare, in a detached fashion, the situation now and, say, ten years ago. Economically, Belarus still depends on Russia for subsidised oil and gas supplies, raw materials and access to the markets as it did ten years ago. Yet Russia still does not control many assets of the Belarusian economy. Economic crises and international isolation has given Russia new opportunities and it finally bought the Belarusian gas transportation system. Skilled Belarusians go to Russia, which needs a labour force, and thus Belarusian enterprises are weakened and can be squeezed from the markets. However, it will have an impact on Belarusian domestic politics and not on its dependent status. The situation has not dramatically changed in the area of foreign relations or defence either. The Belarusian regime has survived on Russian support since 1997. For the first time the United States and the European Union imposed a travel ban on the regime's top officials in 1998 when Lukashenka expelled Western diplomats from their residences. As for closeness to Russia, the regime has been entwined in the integration games since the very beginning. Militarily, Belarus depends on Russia in every regard – from equipment to training and strategy – and it has been so since 1991. The threat to national independence lies mostly elsewhere. Russia supports economically weak and internationally isolated Lukashenka because he guards its interests. Lukashenka has one characteristic which makes him the perfect man for the Kremlin: his reputation in the West is so poor that he cannot desert Russia. Any other Belarusian president – even a very pro-Russian one – will not be so limited in his international manoeuvring. In other words, Lukashenka's main asset is his bad reputation. This policy of Moscow is likely to continue despite occasional quarrels between the two countries. The Belarusian leader demonstrates no wish to renounce his rule. National independence is, probably, a value for him only as far as it helps him to stay in power. Therefore, concerns about Belarusian independence and a possible gradual Anschluss by Russia have been legitimate issues in recent years. Lukashenka, however, is not willing to give away his possessions – including his country – so easily. Alyaksei Pikulik and Dzyanis Melyantsou of the Belarusian Institute for Strategic Studies consider the recent diplomatic scandal as the regime's attempt to break out of the long-standing model of relations with Western countries. According to them, the Belarusian regime wants to demonstrate to the West that unlike Ukraine or Moldova, Belarus does not aspire to become a part of the EU. Therefore, Europeans are not supposed to impose any political demands on Minsk. The Belarusian regime wants to be treated as one a post-Soviet countries which has a very limited pragmatic agenda in its relations with Europe – like Uzbekistan or Azerbaijan. The Belarusian ruler knows well how to play this game with the Russian leadership. He has been mastering his skills to survive despite the Kremlin's pressure since 1994. The regime's and the country's isolation have been ongoing since 1996, with only a brief period of relative engagement with the West in 2008-2010. The isolation has done no known damage to his rule while the collateral damage has included Belarusian exclusion from European processes and strengthening tyranny. In this survival game Lukashenka has already given away some strategic assets, such as the gas pipelines that run through Belarus. They have finally been sold to Russia, although Russia had hoped to take them many years ago. Belarus, also with significant delay, put into effect an air defence agreement effectively giving Russia control over a part of the Belarusian military. But apparently Belarus itself does not need this part of its army that much and Russia is happy to pay generously for its military ambitions. Lukashenka also secured very low prices for Russian gas and oil. While previously 1,000 cubic metres of Russian gas cost Belarus $263, now its price is just $166. Belarus can continue its profitable exports of oil products to Western Europe. Perhaps the present total score for the Belarusian regime looks bad — but there is no capitulation in sight. Moscow hardly has a plan to annex Belarus. The Belarusian issue was absent in the Russian presidential elections. Putin has set forth a broader agenda on a Eurasia-wide scale through its Customs Union. That does not mean that Russia has no interest in controlling its Western neighbour. Lukashenka considers Belarus as his fief rather than a nation which once gave him a mandate to manage its affairs, a mandate which expired years ago. This attitude and his dependance make him a very suitable partner for the Kremlin. Lukashenka ensures that the Belarusian state remains fragile. It also ensures that Belarus cannot develop a serious partnership with the West. Unfortunately, the West can do little to influence Lukashenka or his sponsors in Russia. It may be easier to change the Belarusian people through gradual engagement and patient work.